Charles Lee Flinn was born August 28, 1866, in Tennessee after the Civil War. His middle name most likely was in honor of the great General Robert E. Lee, whom his mother held in high esteem. Charles was the 7th child of Dr. John Carroll and Susan Flinn. 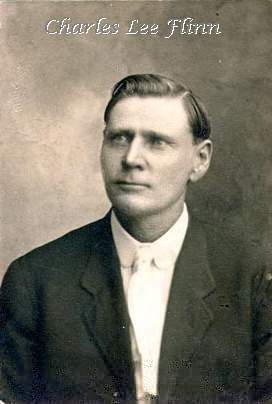 He grew up in Hutto, Texas and Williamson County and eventually married Maggie Elizabeth Hutto, daughter of John Riley Hutto, son of the founder of Hutto. Invitation written by C.L. 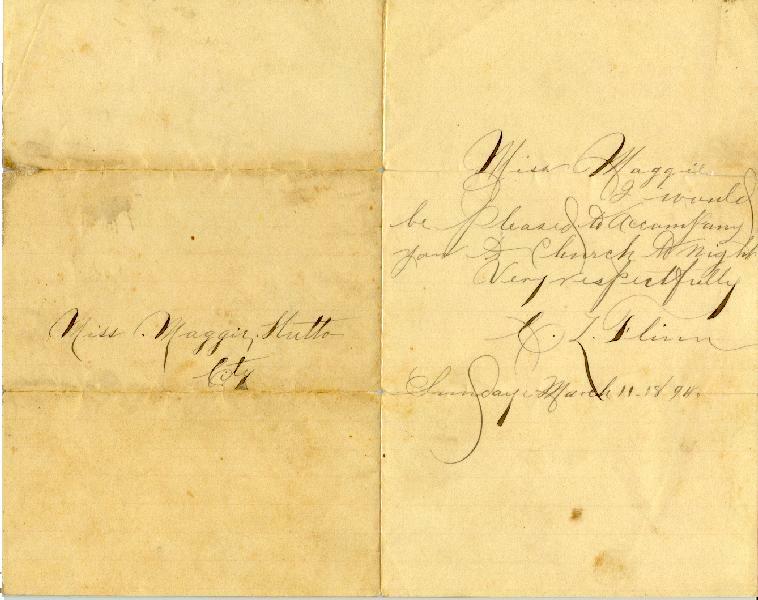 to Maggie in 1894 asking her to go to church with him. Charles and Maggie were married less than a year when Maggie died during childbirth. He focused his attentions on his business endeavors and gathered a substantial estate and yet as he grew older he became ill.
Family members, my Aunt Lucille and Aunt Irene tell the story that Aunt Viola and Uncle Charlie Flinn were childhood sweethearts but something happened and he married Maggie. When Maggie died, the story goes, she made him promise to never marry Viola. But she came and took care of him and lived at his house until his death. shocking to a ten-year-old. She told me she got hit in the chest with a baseball. ???? I remember her. Mr. C. L. Flinn, pioneer resident of Williamson county, died, at his farm home, six miles east of Georgetown, Saturday night, July 7, after a long illness He was 79 years old. Funeral services were conducted at the Davis Funeral Chapel Tuesday afternoon, July 10, at 4 o'clock, by the Rev. Jackson C. Oglesby pastor of the First Methodist church. Pallbearers were nephews of Mr. Flinn. He was laid to rest in the Hutto cemetery beside his wife who preceded him in death. In 1907, and a son, who died eleven months after the' mother. Charles L. Finn, son of Dr. John Carol Flinn and Mrs. Susan Flinn, who was a doctor, came to Texas in 1869 after the Civil War and settled on Brushy Creek near Hutto. He was one of a family of twelve children, three of whom are still living, Mrs. Annie Jarmon and Miss Maggie Flinn of Austin, and Mr. Pat Flinn of Amarillo. 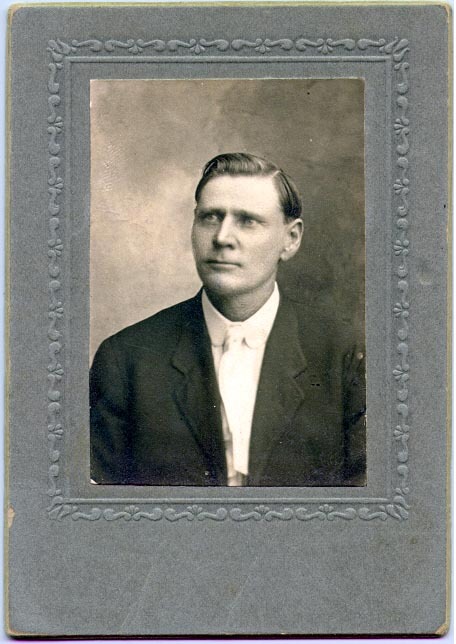 One brother, Dr. Joseph F. Flinn, who had came to Texas as a small child with his parents from Tennessee, was also a doctor, and practiced his profession in Hutto for a number of years. Another brother, Thomas Flinn, served as county clerk of Williamson County for a time. John Flinn was another brother, who lived In Georgetown for many years before moving to Taft, where his death occurred. Mr. Flinn was married to Miss Maggie Hutto, daughter of the pioneers, Mr. and Mrs. J. R. Hutto; of Hutto, in 1896, and was a brother in-law of Mr. and Mrs. W. T. Hutto and Mrs. Mary Brady of Georgetown. Mr. Flinn was a man of sterling qualities, friendly disposition, and of sound business judgment. Besides his farm home here, he owned several farms in East Texas He was a member of the Methodist' church. Miss Viola Harris was his, nurse for eighteen years, during which time he was a semi Invalid. Besides the brother and two sisters, thirty-eight nephews and nieces survive.